Immerse yourself in Greek Revival architecture and life during Austin’s 19th century. 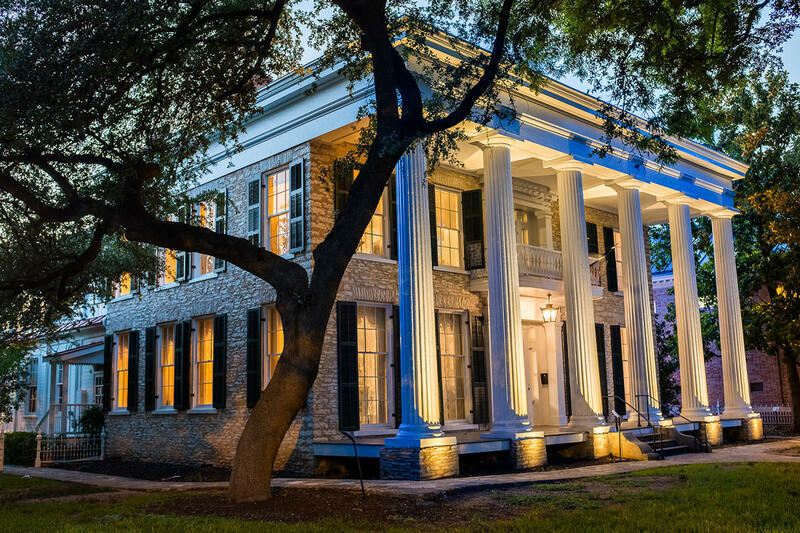 Located near the campus of The University of Texas, the Neill-Cochran House Museum is one of few Antebellum buildings open to the public in Austin. The museum showcases the city&apos;s cultural, economic and architectural transformation from 1855 to present day. Learn more about how to visit this historic icon, what&apos;s on display and when to bring the family for kid-friendly events. Neill-Cochran House Museum. Credit Bill McCullough. Preservationists work to maintain the quality and accuracy of the home’s interior. Furnishings and unique objects dating back to the 1850s are on display, along with an inside look at their backstories. The permanent collections take visitors back in time to Austin’s beginning. Explore the 19th century French parlor, dining room and three preserved bedrooms. The contrast of the museum against its busy West Campus surroundings provides a glimpse into the transformation of Texas’ capital city. The museum displays rotating exhibits year-round. The unique exhibits offer a unique perspective of Austin through art, photographs, interior collections, craftworks and more. Visitors can find a current listing of seasonal exhibits online. The museum also hosts regular free events and showcases which delve deep into Austin’s extraordinary history. Courtesy of Neill-Cochran House Museum. Occurring on the second Sunday of each month, the Neill-Cochran House Museum offers free hands-on activities to the public. From scavenger hunts and historic board games to crafts and more, there are always fun, kid-friendly things to do and learn. The History Lab is an exclusive look at how art, technology, science and history come together, often breaking down a specific historic invention which paved the way for the technology we use today. Bring the whole family and discover what’s in store for the next History Lab! The Neill-Cochran House Museum is open to visitors Wednesday through Sunday from 1 p.m. to 4 p.m. General admission is $5 for adults, $4 for children ages 12-18 and students (with valid ID), $4 for seniors ages 65+ and free for museum members and children under 12. There is a free on-site parking lot and access to street parking nearby. Contributed by Lauren Laird, Visit Austin Marketing Communications Intern.